Statesman and pragmatist, orator and poet, a man of peace and conviction. Atal Bihari Vajpayee was a towering nationalist who softened the often sharp edge of his party’s politics with a gentle sophistry of words, earning him the sobriquet “ajaatshatru” or the man with no enemies. The first prime minister from a non-Congress party to complete a full term in office, Vajpayee’s glorious career saw him go from student activist to journalist, Rashtriya Swayamsewak Sangh pracharak, Member of Parliament, foreign minister, opposition leader and a much-loved leader of the nation. Vajpayee’s signature in politics was achieving pragmatic consensus, and in this process he earned the respect of his party, allies and opponents. Abroad, he projected a harmonious image of India and connected it to the world through his foreign policy outreach. Fluent in English, his oratory was at its best in Hindi. With his well-timed wit, and carefully-chosen words delivered with trademark long pauses, Vajpayee connected with all those who came in contact with him. 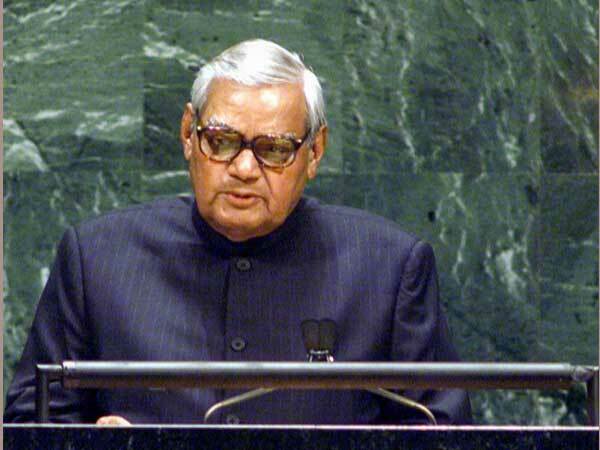 As foreign minister under the Janata Party government headed by Morarji Desai in 1977, Vajpayee was the first leader to deliver a speech to the United Nations General Assembly in Hindi. While his six years as PM were defined by several crises — including the hijacking of an Indian Airlines jetliner to Kandahar, Afghanistan in 1999, an attack on the Parliament building in 2001, communal riots in Gujarat in 2002 — he also left a mark with peace initiatives. During his second term as PM, Vajpayee ordered nuclear tests in May 1998 in a strategic masterstroke to blunt Pakistan’s nuclear ambitions while at the same time announcing a moratorium on future testing. He followed this up with peace overtures to Pakistan, riding on the first direct bus from India to Pakistan in February 1999. But the optimism ended with months later with Kargil war. Vajpayee felt betrayed and never hid his bitterness whenever Kargil was mentioned. He tried again to build peace with Pakistan —which people close to him say was the mission of his life — by holding a historic summit in Agra with Musharraf in 2001, who by then had become the president. But the summit too failed spectacularly. When he assumed office for the second time in 1999 as the head of a more stable coalition, Vajpayee had to abandon some of the cornerstones of BJP's policies to get the backing of more secular groups. This included the BJP’s demands for scrapping the special status for J&K, building a temple on the Babri mosque site in Ayodhya and abolishing the separate civil code for Muslims.